Hollywood survivor Elizabeth Taylor has been in the forefront of the AIDS battle. In an October 1996 appearance before the U.S. Capitol, the actress brought attention to the disease by reading aloud names of people who have died from it. (CNN) -- Elizabeth Taylor has played, on and off the screen, every imaginable role -- child star, perfect bride, mournful widow, home wrecker, Oscar-winning actress and successful businesswoman. But at age 70, she has settled into the role of a lifetime -- crusader in the fight against AIDS. With the epidemic under way in the 1980s, Taylor co-founded the American Foundation for AIDS Research (AmFAR) with Dr. Mathilde Krim. "She understood that you cannot solve the human disease problem, the medical problem, unless you also change people's attitudes," Krim said. Taylor uses her enormous fame to support AIDS research, giving her cause the attention-getting voice of the last major star of the Hollywood studio system era. In 1991, the actress founded the Elizabeth Taylor Aids Foundation. which has distributed more than $8 million to AIDS organizations around the world. A beautiful child, Taylor rose to movie stardom at age 12 in "National Velvet," the 1944 classic about a young girl determined to ride her horse to victory. Elizabeth Rosemond Taylor was born February 27, 1932, in London to American parents. Her father, Francis, owned an art gallery, and her mother, Sara, was a former actress with ambitious plans for her beautiful daughter. With World War II on the horizon, the family moved to Southern California in 1939. The child made her movie debut in 1942's "There's One Born Every Minute" with Carl "Alfalfa" Switzer of "Our Gang" fame. She would soon become a contract player at MGM, one of Hollywood's biggest studios. Small parts followed before she landed the role of a determined girl who wants to run her horse in the Grand National Steeplechase in "National Velvet" in 1944. She was a sensation at 12. "I didn't know that it was a career," Taylor said. "It didn't occur to me. It just seemed like a more concrete extension of make-believe -- my own games." It wasn't easy being a child star. "The truth of it is, the worst way to grow up ever is to be a child actor," said Darryl Hickman, a fellow child actor and friend. "It was very difficult to be treated the way she was treated," he added. "The studio used her. I think, probably, her parents used her. I think the public used her. I think the media used her." Unlike many child stars, Taylor didn't have an awkward adolescent phase. It seemed as though she became a woman overnight. "We were all under contract together, but one day I saw her as a girl," Hickman said. "And the next day, she must've been 14 or 15 ... suddenly, there was the most beautiful woman I ever saw." With her multiple marriages and volatile personal life, the glamorous actress became one of the top box-office stars of the 1950s. MGM executives knew they had found a star. And conveniently for the studio and its publicity machine, Taylor's 1950 marriage to the heir to the Hilton Hotel fortune, Nicky Hilton, coincided with the release of the movie "Father of the Bride." To ensure a fairy-tale event, the studio designed the 18-year-old's wedding dress, bridesmaids' dresses and arranged the flowers. The event was the first of several key moments in Taylor's life under intense press scrutiny. Her first marriage would not last. In less than six months, the union was over. Then, at 19, Taylor married British actor Michael Wilding in what they thought would be a quiet English wedding, but the event was another media sensation. The couple had two children, Michael and Christopher, while Taylor's movie career continued to climb. In 1955, she began shooting "Giant," a film starring heartthrob Rock Hudson and young upstart James Dean. By the time of "Giant's" premiere a year later, her relationship with Wilding was over, and she then began a new romance with producer Mike Todd. Taylor described an electric meeting with Todd soon after her separation. "Mike just charged in, I mean rather like a bull ...," she said. "He grabbed my arm. He sort of plunked me down on the couch, pulled a chair around, started in on a spiel that lasted about an hour and a half without a stop ... saying that he loved me. And that there was no question about it, but we were going to be married. I was absolutely sort of hypnotized." The couple married in 1957 and had a daughter, Liza. Less than a year later, Todd was killed when his plane, the Lucky Liz, went down in New Mexico. "We only had 13 months together, and I loved him with my life and had a 6-month-old baby," Taylor said. "I never thought I'd love again. It was a disaster." Taylor sought comfort in Todd's close friend, singer Eddie Fisher, who was married to actress Debbie Reynolds. The public was appalled when Fisher left Reynolds to be with Taylor. Taylor converted to Judaism and married Fisher in Las Vegas, Nevada, in 1959. The star and Richard Burton began a scandalous romance on the set of the 1963 epic "Cleopatra," one of the costliest movies ever made. A dream team for the tabloids, the famous couple married and divorced twice. Despite her chaotic personal life, the star's acting career was flourishing. In 1958, Taylor finished filming "Cat on a Hot Tin Roof," for which she earned a best actress Oscar nomination. Maggie the Cat was the first of several Tennessee Williams heroines for Taylor. "Liz Taylor is one of the great phenomena and symptoms of our time in America," Williams wrote in a February 3, 1961, essay for Life magazine. "Everything she has done with her life has been startling and sometimes implausible. It's hard to guess what Liz wants out of life: the million-dollar contracts and diamond necklaces or the exercise of what is probably the finest raw talent on the Hollywood screen," the playwright commented. Taylor starred in another successful movie adaptation of a Williams play, "Suddenly, Last Summer," in 1959. She earned another Oscar nod and some of the best reviews of her career. "I do think 'Suddenly, Last Summer' is her best performance," said writer/director Tom Mankiewicz, son of "Suddenly, Last Summer" director Joseph Mankiewicz. "It's just extraordinary and sometimes a little overlooked because she's always on the screen with Kate Hepburn and Montgomery Clift and so on. But she's the one that's dishing it out and doing it. She's terrific in that picture." Soon after, Taylor became the first actress to receive $1 million when she was offered the title role in "Cleopatra." In late 1960, Taylor went to London to start filming, but she came down with a viral pneumonia that nearly killed her. In April 1961, one month after an emergency tracheotomy that saved her life, Taylor accepted her first Oscar for her role as a call girl in the 1960 movie "Butterfield 8." 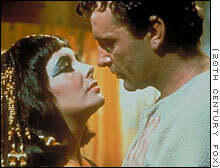 As shooting of "Cleopatra" resumed, Taylor became enamored with actor Richard Burton, who played Mark Antony. The film was epic in every regard, including the real-life love affair that erupted between Taylor and Burton. Again, lives and marriages would be torn apart. Burton would split up with Sybil Burton, mother of his two small children, and Taylor would end her relationship with Fisher. After much criticism from the press, several U.S. congressmen and even the Vatican, the couple married in 1964. Together, they adopted a child, Maria. For a decade, Taylor and Burton dominated tabloid headlines with their up-and-down relationship and lavish jet-set lifestyle. They starred together in 10 films and one TV movie, but their finest moment was probably in 1966's "Who's Afraid of Virginia Woolf?" Taylor earned her second Oscar, surprising fans and critics with her portrayal of a bitter, middle-aged wife of a college professor. The couple divorced in 1974, then remarried and divorced again in 1976. "I think we were two very volatile people," Taylor recalled. "As a matter of fact, we were like two atom bombs, and when we'd go off together, there'd be this tremendous explosion, but we'd come down together and we didn't sulk and we didn't pout and it never lasted. And we had a ball fighting." After divorcing Burton a second time, Taylor retreated from the Hollywood spotlight to the horse country of Virginia, where she met politician John Warner. The two married in 1976. But the role of a U.S. senator's wife didn't suit Taylor, and the actress and Warner ended their marriage in 1982. The late 1980s and early '90s were a difficult time for Taylor. Despite proving herself a successful businesswoman with best-selling perfumes, she seemed to lose hold of her acting career, and the media was consumed with her unusual friendships with Malcolm Forbes and Michael Jackson and her constant battles with her weight. She also coped with the death of Burton in 1984. "I was unhappy. I was lonely," she said. "I wallowed in it. I mean with the booze and the pills and the food. It was all cross-addictive. And I was slowly sort of letting myself die." In 1983, Taylor checked herself into the Betty Ford Center in Rancho Mirage, California. "I admitted to myself that I was an alcoholic and I had a problem with prescription pills," she said in 1986. "In order to survive, in order to live, I had to change that. And I wanted to live and be a whole, complete human being." During a second stay at the clinic, she met construction worker Larry Fortensky. In 1991, they married in an elaborate ceremony at Jackson's Neverland ranch. But this union wouldn't last either, and the couple divorced five years later. No longer someone's wife, Taylor immersed herself in the battle against AIDS -- a cause she had been passionate about for a long time. She co-founded AmFAR in 1985, the same year her dear friend and former co-star Rock Hudson died from the disease. Since then, from testifying on Capitol Hill to lobbying politicians for research money, Taylor has been fighting for the cause. Despite her many illnesses in recent years, including the removal of a benign brain tumor in 1997, the star, who recently became a septuagenarian, doesn't seem to be slowing down. "She likes life," says actor George Hamilton. "And that's what's so amazing. You know, she's very two-fisted about it all. And very few people embrace life." Or as Taylor puts it, "I have had everything. I've had my share of joy, pain, luck and rough times. ... I've been back and forth like a yo-yo. I hope I've learned from all the experiences I've had."